PANAMA CITY, April 10, 2019 /PRNewswire/ -- Government and business leaders from the UAE and the Latin America and the Caribbean region (LAC) reinforced their commitment to improving bilateral ties and expanding economic cooperation at the third Global Business Forum (GBF) on Latin America, which began April 9th in Panama City, Panama. Organized by Dubai Chamber of Commerce and Industry in partnership with Inter-American Development Bank (IDB), GBF Latin America – Panama 2019 was attended by H.E. Juan Carlos Varela, President of the Republic of Panamá; H.E. Jovenel Moïse, President of Haiti; policymakers, ministers, top government officials and business leaders from the LAC and GCC regions. H.E. Majid Saif Al Ghurair, Chairman of Dubai Chamber, revealed Dubai Chamber's plans to open a fourth Latin American representative office in Mexico City later this year which he described as a strategic move that will enhance its efforts to expand trade between Dubai and Latin America. 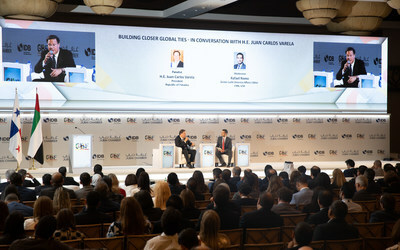 He noted that GBF Latin America – Panama 2019 comes at a time when bilateral economic ties are expanding rapidly as reflected in Dubai's non-oil trade with Latin America which has surged 46 percent from $4.6 billion in 2011 to $6.7 billion in 2018, while the emirate continues to boost its exports to the region.